Gus & Lula: Something is terribly wrong with me. Something is terribly wrong with me. 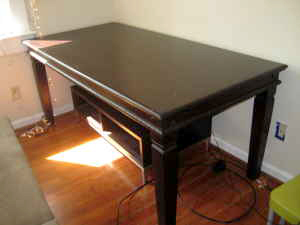 The table in the foreground used to be a bed. Perfectly fine. But did I go ahead and completely dismantle it? Yes. Yes, I did. The floating tables in the background? Used to be a perfectly fine side table. Did I saw that sucker in two? Yup. I just might have a problem. a custom built-in desk for our weird, cabinet-less kitchen nook. 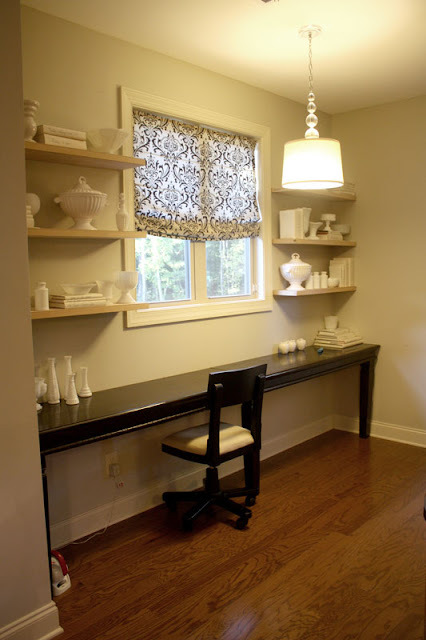 It is a great workstation, it brings the dark stain from our cabinets around to this side of room, and finally gives this nook a function! I'm learning to live with my sickness, and to accept that this is just who I am. Furniture beware! WOW! This is fantastic! 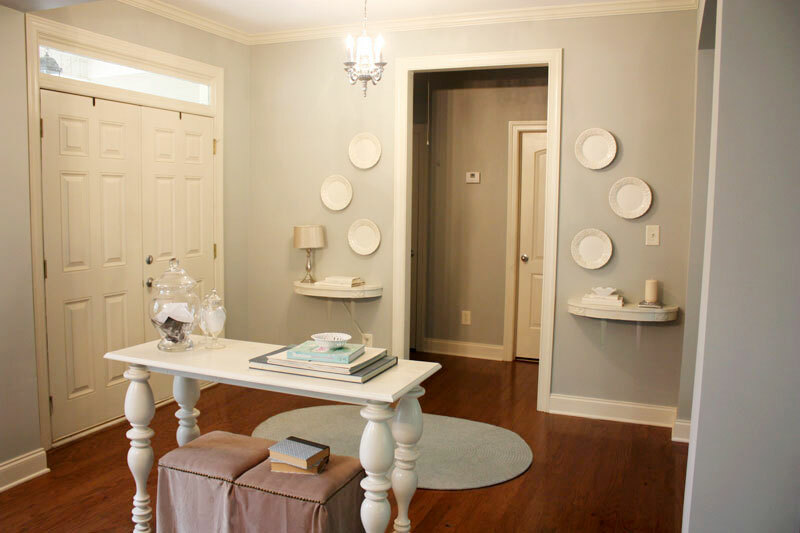 And it would be a perfect spot for a buffet spread when you're entertaining... Well done! I love what you've done in that nook! What an awesome idea! Wow that looks amazing! You have quite the furniture vision! Brilliant! And it looks like they fit perfectly! By the way, I am LOVING your blog...just found it recently. You have really inspired me to get my decorating groove back. I have an architecture degree and was a designer before I left to be a full-time mommy. Money has been tight around here ever since, and I've felt limited as to what I can do to improve my home. Thanks for all the wonderful ideas! looks amazing. what a great vision! I love it Britt!! Perfect for that space! Sorry we did not get to see it last night. I guess y'all had a small crowd since 3 families were sick. Hope there was enough food! See you soon. Amazing...I love it all. I hope what you have is catching! That looks great!! I wish I could envision things like you do! Thanks everyone! Amanad - I hadn't thought about using it as a buffet. Great idea! That's really pretty. 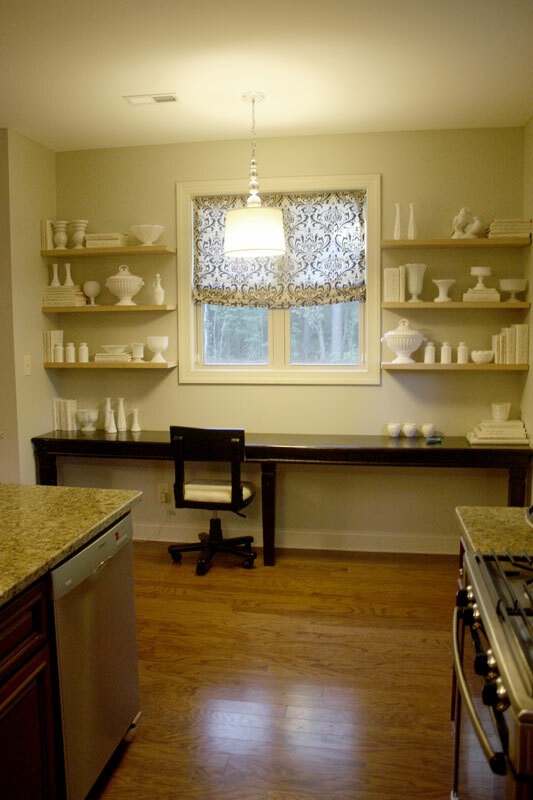 I like the way your serving dishes are arranged on either side of the window. So pretty! You are SO creative! By the way, where did you get the curtain in the window? Dawn, thanks! I made the shades in my kitchen. I'm pretty sure they're in my "project file" tab if you want the step-by-step. Wow! i love it- you are a genius! I love what you did with the table..WOW ! Great job!! So, how did you come up with the long desk? Cut the table in half? Or did you just use the legs and apron and make a new top? Very curious. And now I have to get out of here as I've just spent the last hour drooling over all your amazing projects and house! Sawdust Paperscraps- We cut the table straight down the middle. We used all of the original table except about 6" that we took off one end so the two new halves would fit snugly together. Sawdust and Paperscraps - we just cut the table straight down the middle. We used all of the original piece except about 6" that we cut off one end so the two new halves would fit snugly together in the middle. Sawdust and Paperscraps - We just cut the table straight down the middle using a table saw. We used all of the original table except about 6" we cut off one end so the two new halves would fit together snugly in the middle. This is ingenious! I am so impressed with your vision! What a great use of space!! That looks terrific! I did a similar project and used half the table as a custom sideboard in my breakfast area! Gotta love craigslist deals and a repurposed beauty! Thanks for sharing this!